A few weeks ago I published a piece entitled Calling Fiber by its Name. Based on a decision by French authorities, operators offering coaxial (FTTLA) or copper (VDSL) fiber based products can still use the word Fiber in their advertising but have to specify that the termination is not fiber. Cable operator Numéricable/SFR went ballistic when this was announced and threatened to appeal the decision, arguing that there was no difference in service between FTTLA and FTTH. Well, we have an answer to that question, and it’s one that Numéricable/SFR isn’t going to like. Late last week, French regulator ARCEP published the results of their QoS panel testing. It shows without a shadow of a doubt that FTTH performance is way ahead of even the best FTTLA offer on the market. The difference is most visible on upload capacity and latency, but even on download there’s a stark difference. A few important caveats: ARCEP distinguishes between cable offers at 30 Mbps, 100 Mbps and 200 Mbps download speeds but lumps together all FTTH offers not matter what speeds. For this comparison I took the best available cable offer (200 Mbps). What this means is that the comparison is unfair to FTTH because the baseline for the incumbents’ FTTH offers is 100Mbps. 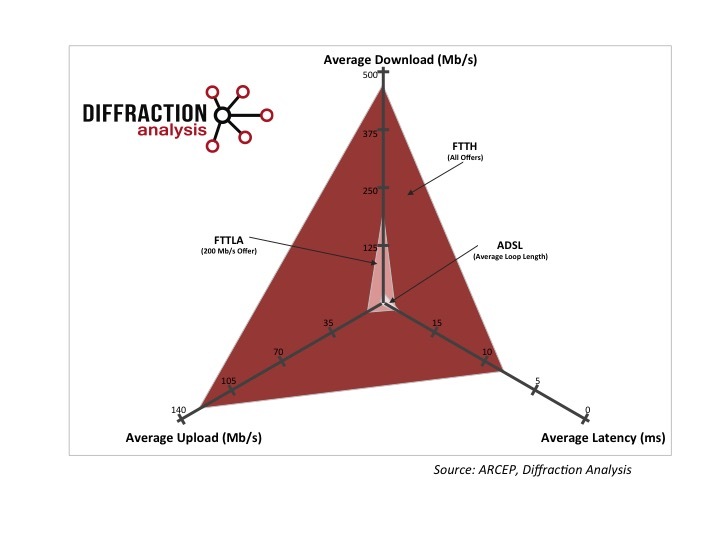 Despite this though, FTTH is more than twice as good on download as FTTLA (and 45 times as good as ADSL), it’s 13 times as good as FTTLA on upload (and 130 times as good as ADSL) and twice as good on latency (not that the axis is inverted since lower latency is better.) So no matter how you slice it, FTTLA is not as good as FTTH, and pretending otherwise is just plain lying. One might argue that most users don’t need the kind of performance FTTH demonstrates in France. It’s debatable, probably worth discussing, and some elements of the ARCEP panel suggest that for common uses of the internet (browsing, video streaming) there may be little perceivable difference by end-users. But no one would pretend that a Maserati and a Renault are functionally equivalent because no one needs to drive at 350 km/h. FTTLA and FTTH are different, and customers should be aware that what they are being sold is not the same thing.